Styled with a cushion shaped cluster of sparkling diamonds, this elegant 9ct rose gold Princessa ring is crafted with a dazzling diamond surround, and diamond set shoulders for added indulgence. 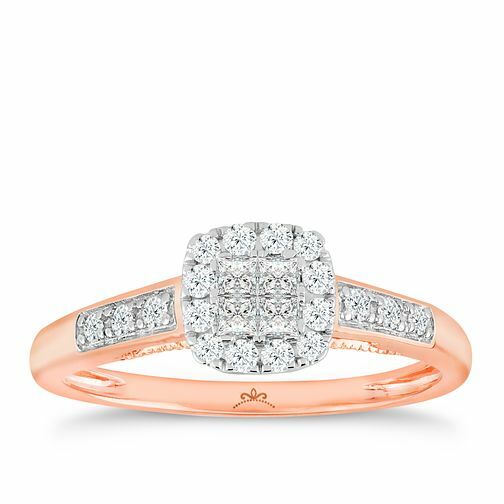 Princessa 9ct Rose Gold 1/3ct Diamond Ring is rated 5.0 out of 5 by 5. Rated 5 out of 5 by Anonymous from Beautiful rose gold ring My husband bought this for my anniversary. I’ve recently gone back to rose gold after getting fed up with white gold as it has to be rhodium plated every so often. I also have a nickel allergy and until recently didn’t realise white gold can sometimes contain nickel. I have a rose gold wedding ring, this ring compliments it beautifully and I also bought the rose gold narrow eternity ring. Loving the rose gold colour and the sparkle of this ring. I wear silver and rose gold together on my other hand, it all looks great together. Rated 5 out of 5 by Anonymous from Just beautiful Received this engagement ring from my boyfriend. I can’t stop looking at the ring. The most romantic day ever.